Way back in October before I even started the DCP, I posted an entire bucket list that I wanted to do during my program. Throughout the five months that I was in Florida, I actually managed to do the majority of the activities I had listed! I deleted and added some at some points in time, but otherwise it was very similar to the original. I'm going to make a post for each of the bucket list items I completed, starting with the first: Meeting all the Disney princesses! I actually met Snow three times during my program. 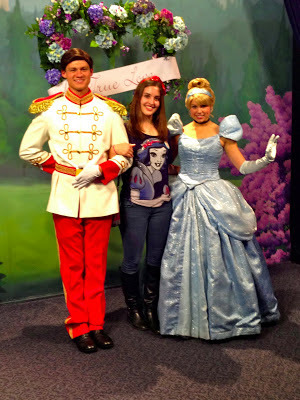 The first time was during my birthday, where I also got to meet Snow Prince and Dopey! The second time I filmed a short little clip wishing my mom a happy birthday, and the third time I was dressed in my Halloween Disneybound outfit! My favorite time that I met her was definitely on my birthday, because we talked about more things and Dopey just made the entire experience fun. Snow is seriously adorable though, and she's definitely one of my favorite Disney princesses! Since Cinderella is in Town Square Theater for meet and greets, I got to see her quite a few times. Personally, I find her kind of boring...except for one time before Easter when I met her she asked if my friends and I wanted to go to the ball so we could meet all the available princes. She'd have her fairy godmother make dresses for us and everything! I do love her new dress though. It's seriously gorgeous. Aurora honestly surprised me each time I met her. I was expecting it to be a little boring like when I'd meet Cindy, but each time I met her we had nice conversations that weren't awkward at all. She was actually one of my favorites to meet on my birthday. She also let me take a greeting video of her saying hi to my best friend from back home since she's her favorite princess. The last time I met her, she was wearing her new dress. I ADORE it!! It's SO much better than the old clunky one she had (like in the picture above.) I also got to meet Phillip during my birthday the first time I met Aurora. He didn't say much, but it was pretty neat. Ariel was actually the very first princess that I met! I met her twice. The first time was a little awkward because I hadn't met a face character since I was really really little..and even back then I was scared of them. Ariel told me she liked the bow in my hair, and I asked where she got her flower in her hair. She just told me she picked it somewhere in the ocean...exciting story, I know. The second time Ariel asked where we were all from and if we were sisters. We told her we were roommates and from all over the country. That's really it! Nothing too exciting with her, unfortunately. I got to meet Belle twice! The first time was actually during her new attraction: Enchanted Tales with Belle. My friends kind of forced me to be in the show, so I was a dancing pepper shaker. When I went to take a picture with her we didn't get to really talk except for her thanking me to be in her show. The second time we met her I filmed the second half of my birthday message to my mom. She was so sweet! She also talked to my best friend Lizzie about Lizzie's favorite ride, The Haunted Mansion. They talked about how she always got scared when the heads popped up behind the gravestones, and Beast had to protect her because he's extremely brave. She was adorable! The first time I met Jasmine, I was honestly disappointed. She was kind of rude to Lizzie when she asked if she could take a picture on her phone with just the two of them (a selfie, to be exact). Jasmine kept telling her to have me take the picture...which kind of ruins the point of a selfie. At one point Aladdin was even like, "Jasmine is confused." We ended up just taking a group photo. The second time we met Jasmine was MUCH better. We were all in our Disneybound outfits and she had each of us pose like our princesses. It was really fun! Pocahontas was so cool! She took my friend Jake by the arm when she was walking him from the line to her meeting spot, and told him he had a strong name. When I met her she asked if I had any adventures in mind, and if she would like to join her and Meeko when they go jump off waterfalls together. She also asked if Sara had raccoon treats in her backpack! She was just a lot of fun and definitely one of my favorites! Mulan was so cute! When I met her I was wearing my purse that goes across my body, making it kind of look like a satchel. She asked me if I was using the bag to prepare for battle, and honestly I kinda froze and answered, "Maybe?" I was awkward...but she thankfully played along and didn't say anything about my mediocre answer. One thing I recommend for you guys if you ever meet characters: don't be afraid to play along and pretend with them! It makes it so much more fun! I learned that later on during my program. I adore Tiana! She was one of my favorites to meet on my birthday, mainly because Naveen was there! I talked about the experience I had when I met Naveen for the first time, and how he recognized me from buying Dole Whip from me at the Polynesian. I met them a second time and he remembered me again! Turns out, his "friend" was doing the college program. Who would've thought? Tiana is such a sweetheart though. She asked me about what kind of seafood recipes she should know about that I serve at work...but it was awkward because we don't really serve seafood excpet for mahi mahi...(which I couldn't remember at the time). But she still played along and made everything really fun. Rapunzel is so adorable! 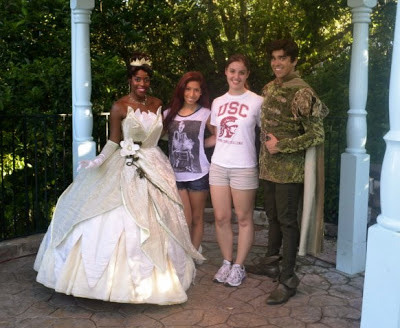 First time I met her was again on my birthday...but Flynn Rider was there!! I was honestly more excited to meet him, but when I went up to meet the two of them Rapunzel was the one that talked the most. Mainly because it was my birthday and birthdays are her favorite. I think I met her around three times...can't quite remember. She was fun each time we met though, and got really excited when one of my friends was her for our Disneybound day! It took us FOREVER to finally meet Merida! Her line is always so long! However, after we watched her coronation one morning, we decided it was a necessity to make a trip to Magic Kingdom with the sole purpose of meeting Merida. She was hilarious! I asked her what it was like to be an official Disney princess, and she said, "Spectacular! It's exactly how it was before, except now you can call me an official Disney princess." She also asked if Sara could teach her how to curtsy, which was really funny! I have it all on video and I plan on including it in a Magic Kingdom vlog sometime in the near future. After meeting Merida, I had officially met every single Disney princess! Character hunting is seriously one of the most fun experiences you can do in the Disney parks, and I'd definitely recommend it to anyone who doesn't feel like going on rides all the time! Every character meet and greet is different, even if you've already met a character before! If you want to follow my DCP story, be sure to subscribe, and also follow on Tumblr, Twitter, and Facebook! Whatever happened with all of your roommates? Were you close with them all? Some seem to have fallen off the face of the earth - Like Brianna - Never heard about her. Did she drop out? I wasn't necessarily close with all of them, but we got along for the most part. I'll make a post explaining everything about having roommates and how we worked out. It's worth explaining! So many princesses! Jealous of you. I'm glad it was an awesome experience overall. Bestie is trying to convince me we should do the program together. If we do, I'll be turning a lot to your blog for tips! Thanks, Sara! DO THE PROGRAM!!! It's so worth it! If you're worried about college, it'll be there when you leave, AND you can take classes online to not be totally behind. Gahhh I hope you do it!